New drivers and visitors to Tasmania, Please download this PDF file or pick one up in a Service Tasmania store. 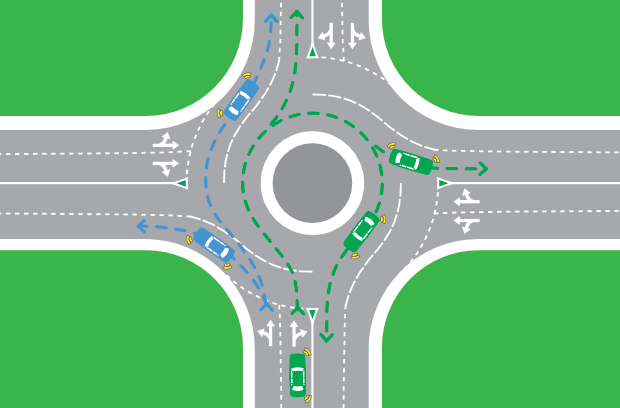 Drivers must slow or stop to give way to any vehicle already in the roundabout. Drivers must also continue to use their indicator if they intend to turn left, right or make a U-turn. Drivers must indicate left on approach and be travelling in the left-hand lane (unless there are road markings with other instructions), stay in the left lane and exit in the left lane. Drivers may approach the roundabout from either the left or right lane (unless there are road markings with other instructions). Drivers must indicate right on approach and be travelling in the right-hand lane (unless there are road markings with other instructions). All drivers are required to drive carefully and slow down or stop to avoid a crash. If a driver is turning left or right at an intersection, the driver must give way to any pedestrian crossing the road the driver is entering. This applies to intersections with and without traffic lights. For their own safety, pedestrians should always check their surroundings before crossing the road. if it can be operated by the driver without touching any part of the phone, for example through the use of Bluetooth technology or voice activation. be used for text messaging, video messaging, emailing or similar. Drivers can only use a hand-held mobile phone if their vehicle is parked in an authorised parking spot. They cannot use a hand-held mobile phone while stopped at traffic lights. Drivers may use the navigational or GPS function and audio functions of a phone while driving, provided the phone is secured in a fixed mounting. 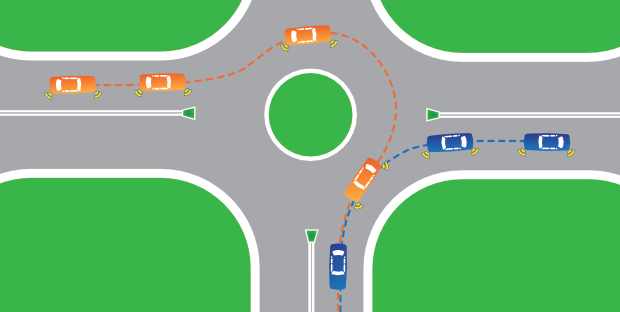 When a driver is travelling on a road without lane markings and the number of lanes or lines of traffic is reduced, they must merge by giving way to any vehicle that is ahead of them. This is often called a zipper merge. Car B gives way to Car A. When a driver is travelling in a marked lane which is ending and is required to cross a broken painted line to enter the adjacent lane, the driver must give way to the traffic travelling in the lane being entered. Car A gives way to Car B.
driving in a special purpose lane or if there is a Left Lane Must Turn Left sign or a left traffic arrow and the driver is not turning left. A driver must not use any light fitted to their vehicle that may dazzle another road user. A driver is only permitted to use fog lights if driving in fog, mist or other atmospheric condition that restricts visibility. give way to all vehicles and pedestrians. two parallel continuous dividing lines. Drivers are not permitted to make a U-turn at traffic lights unless there is a U-Turn Permitted sign displayed. 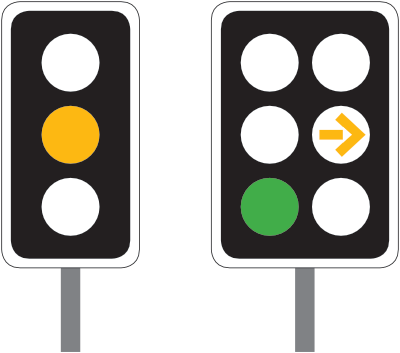 Drivers should select a mark or object on the left hand side of the road, for example a sign or a power pole. As the rear of the vehicle ahead passes the chosen object, the driver counts ‘one thousand one, two thousand two, three thousand three’. This should take about three seconds. 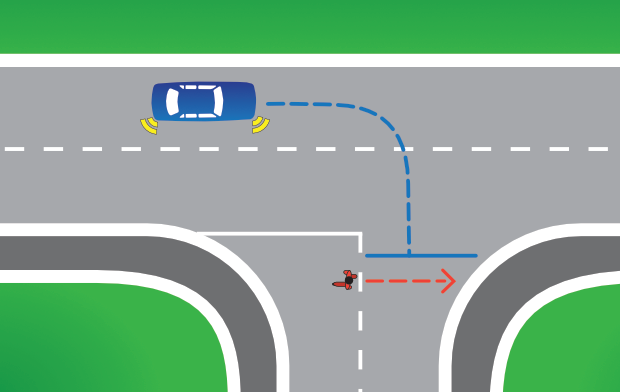 If the driver’s car passes the chosen object before finishing the three second count, then they are travelling too close to the vehicle in front. There is not enough crash avoidance space so the driver should slow down and repeat the exercise to ensure the three second gap is achieved. In poor conditions such as rain, gravel roads or dim light, it may be necessary to increase the travelling distance to four seconds to increase the crash avoidance space. A school zone is the area around a school with a speed limit of 40km/h. Between the School Zone and End School Zone signs, drivers must obey the school zone speed limit. A yellow (amber) traffic light or arrow means stop. A driver approaching traffic lights showing a yellow traffic light must stop if the driver can stop safely before reaching the stop line or traffic lights.